This is one of a kind heart-melting mother and daughter moment. Without our parents, especially our mother, we will never be in this world. We will never achieve all our dreams and goals. Without their support and encouragement, we wont be in our places today. They carried us in their womb for nine months, they gave birth to us, they cared and loved us. 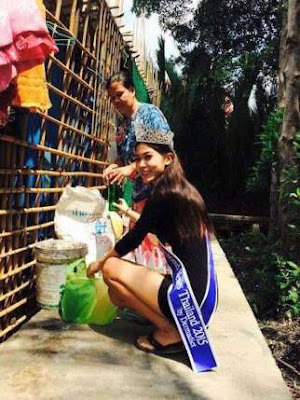 What this Thai beauty queen did after he won a pageant was so heart-warming. Khanittha 'Mint' Phasaeng, 17-year-old, won the title Miss Uncensored News Thailand 2015. According to reports, Mint's parents had separated when she was young and her mother had remarried. She was raised in poverty. Mint stopped her education after high-school because her mother simply couldn't afford to send her to college. They lived in a 4-by 5- meter shack with her other five family members. Her mother Orathai Pormuan, is a garbage collector. After winning the pageant, Mint traveled home to thank her mother for everything she had done for her. "When the referee announced the winner it felt like a dream. I thought how an ordinary girl like me can be a beauty queen," Mint said. Her pictures kneeling down infront of her mother as a symbol for her never-ending gratitude towards her had became viral all over the social media. Its not only she won the title but she also won the hearts of everyone who saw what she did. Mint wearing her glittering crown, her silk sash and heels knelt before her mother in front of filthy rubbish bins to thank her for all she has done. “I am very happy about winning at the pageant and thankful to my mom for providing for me what I needs. What I have now is because of my mom. Our family makes a living through honest work, so I have never felt ashamed or inferior to others,” Miss Uncensored News Thailand 2015 said. In Mint's culture, kneeling in gratitude is the highest form of respect, and Mint said that she was never ashamed of working with her mum, who raised her alone, in the rubbish . "What I have today is because of my mother. She and I make a living by doing honest work, so there is no reason why I should feel inferior," she said. "The family will continue to be scavengers. My mother will still go and sort garbage and is not willing to let me help." Mint maintains to have optimistic outlook on life, she helps her family by working on many low jobs, and also she's assisting her mother when collecting and recycling garbage. 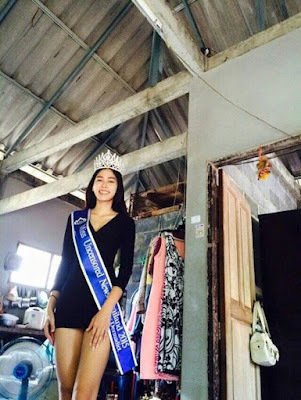 She was recommended to join in a beauty pageant in Thailand and she never imagined winning the competition. After winning, Mint has lined up work as a model for commercials and acting. She is really thankful to her mother.